I've been beating the drum for improvements to Tableau's dashboards ever since they were introduced. As a way to get more than one worksheet into the same visual space they were adequate, and they still work OK/tolerably/nottoobad/betterthannothing, etc. for those situations where you only want to double-click 2, 3, or 4 worksheets and have Tableau put them into a grid-based layout. 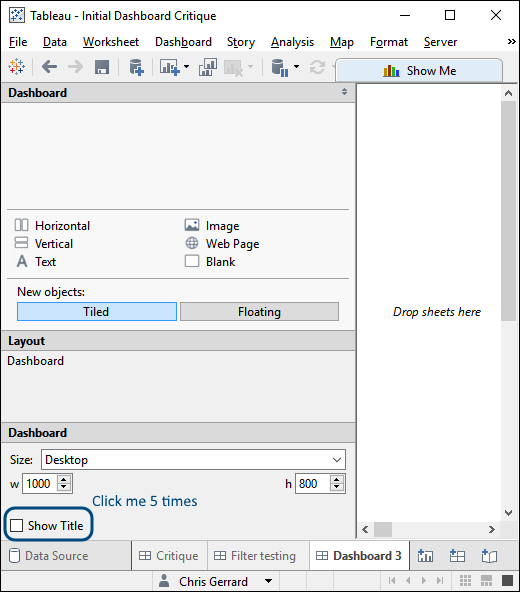 Over the years I've been using Tableau there's been far too much time consumed with fiddling, faking, fooling, and futzing around with dashboards. Time that takes away from the real value of helping people discover, understand, and communicate useful and valuable information in the data that matters to them. Yes, Tableau has made improvements to Dashboards and dashboard creation and maintenance. And some of these are really welcome, as far as they go. For example, the introduction of the Layout control in the Dashboard Window was a half-quantum leap forward. For the first time we could see, without use of external tools, how the elements in a Dashboard related structurally to one another. But as good as it was, as much a leap, it was still only a half-step forward: the Layout control is so small, and it's selection management abilities so poor, that using it is an exercise in multi-click hell. And it's still easier to get a comprehensive view of Dashboard contents with external tools. It was at this point of describing my frustrations with a colleague who was relatively new to Tableau, and didn't have any experience in more sophisticated tools, that she said, in effect: "well, I don't see what's wrong with it, so why don't you show me?" Hence the following diagram. I created a simple, two-sheet dashboard and used it to illustrate some of the problems that jumped out. It's in no way comprehensive—I tried to keep it relatively simple. The Tableau Public published version of this workbook is here. A concrete example. Have you ever been wrestling with a dashboard, trying to get things nicely organized and arranged, only to have Tableau seemingly go insane, moving things around that you haven't touched, making it difficult to place and resize things that only a moment ago were all nice and tidy? The following example shows one of the things that can contribute to the chaos. Start with a newly created dashboard. After all the Title Showing and Unshowing you should see that Tableau has gone ahead and created this container structure for you. This is bad. But it gets worse—once a Dashboard is populated with actual (human) content Tableau will insert containers as you, the dashboard author, do your authoring. This can make for extremely messy situations. I am glad you made this post, this is one of the things that infuriates me, particularly when i deliberately trying to flow two different data sets with different goals in a single timeline. 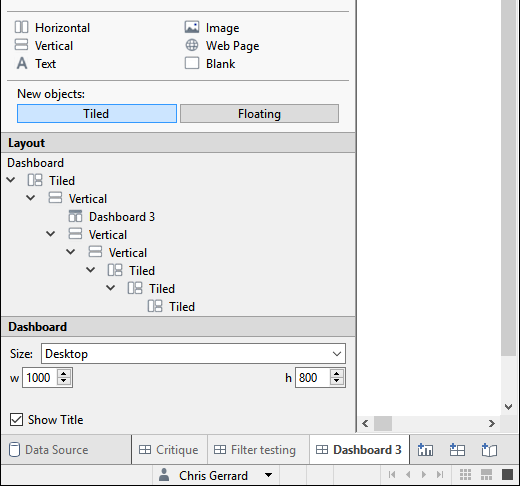 Chris: I totally agree and when I develop dashboards, alignment and formatting is critical to me. I'm a stickler on these aspects as presentation is very important. I also find it sometimes I am not able to align elements exactly perfect (for some odd reason, depends on axis or header, etc). In its current state, I am spending much too long in Tableau dashboard formatting. 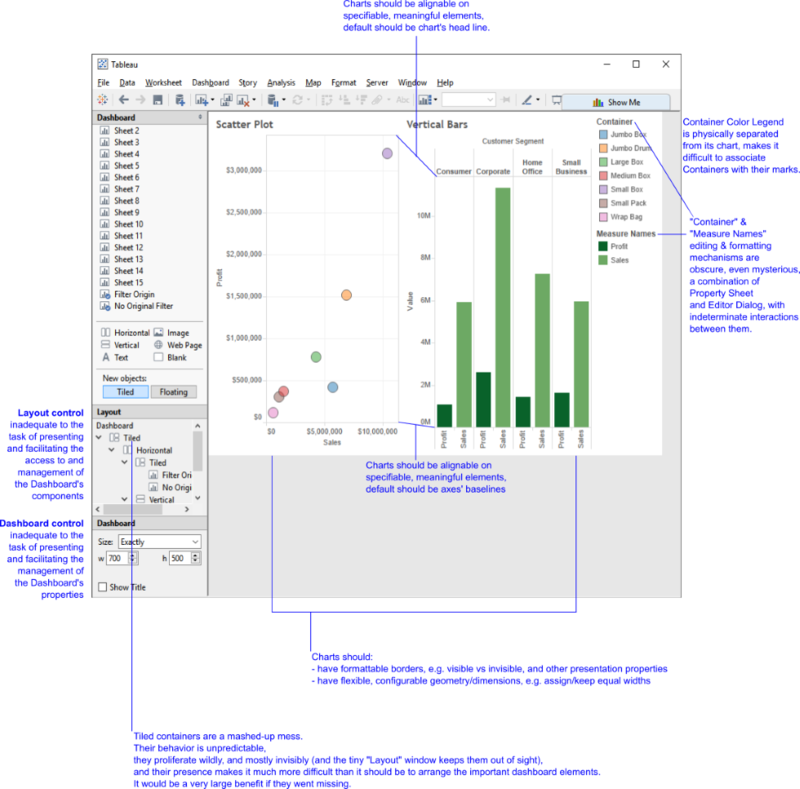 Are you aware of any movement on the Tableau development side to improve dashboard design aspects? I have Tableau 10 beta, but haven't had a lot of time to evaluate all areas yet. I did hear about more global formatting, but not sure on alignment aspects. Very nice example with the Show Title button. I have to say I also ignore the Layout tiled structure because it feels overcomplicated. I also usually immediately either remove the legend bars from the side if they're not necessary (in your case the Measure Names one since axes are labeled) or I might add them on top as a small pie chart with legend that simultaneously functions as a filter as an indication of group size. But in general I agree that the layout and the legends could use some attention to make them easier to use. Chris, this is something that drives me crazy. I do not like all the extra time I have to spend formatting to make something look good. Other products offer the ability to lock into a grid or click on two things and make them the same size or to layer charts with real transparency or to have images in the background to show through the displays. For all I know Tableau has this stuff, but a lot of the simple formatting seems to be mysterious.